Checkers wearing off some energy in the winter of 2001. 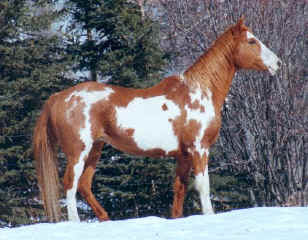 Checkers joined the ranch in October 2001, along with her daughter Parti. 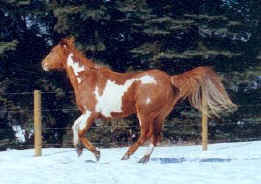 She was not bred that year so we had to wait another year for a foal from her. She is a big strong mare standing 15.2hh. Her foals are usually as big and strong as her, and are a pleasure to work with. You can view some of them below. Checkers is a broke mare and good with kids, but she has been a broodmare for the last 8 years atleast and has not been ridden.